Think of Will Kimbrough as the Sherlock Holmes of songwriting — a sharp-eyed observer of humanity who notes every detail and spares nothing in his analysis. His new case study is Sideshow Love a dozen songs that play out like a collection of smartly crafted short stories, laden with generous melodies and arrangements that balance virtuoso playing with just the right amount of space to let each of the characters within them breathe. The theme is a familiar one: love. But what’s novel is the telling. Kimbrough’s perspective shifts effortlessly between sharp- and misty-eyed, from laughter to tears, as he weaves an arc through the stages of a romance over his eighth solo release’s course. Kimbrough found the axis for Sideshow Love in the song “Home Economics,” a cynical, tongue-in-cheek take on the differences between men and women inspired by a friend’s divorce. The tune employs a 1920s New Orleans string band jazz sound conjured by Kimbrough’s banjo and slide guitar and Paul Griffith’s dusty snare drum. Lisa Oliver Gray, who completes the album’s core trio, adds her sweet ‘n’ salty voice to the mix. Kimbrough had accumulated those songs while he was authoring a new chapter in his distinguished history as a sideman, playing guitar in Americana icon Emmylou Harris’ band. He’s also accompanied such songwriting luminaries as Rodney Crowell, Kim Richey and his longtime friend and accomplice Todd Snider — all the while never letting his own pen-craft lag. He chose “When You’re Loving Comes Around,” with his blues guitar licks and whispered-gravel singing, to set the album’s musical and conceptual tone as the opener. A celebration of the “empty magic moment” when love ignites, it begins the disc’s arc, which traces a romance through the stages of limerence, dissatisfaction, acceptance and, perhaps, at the conclusion, new hope. “I didn’t want these stories to have an unhappy ending, so I chose ‘Emotion Sickness’ as the last tune,” Kimbrough relates. It’s a country song with a strong soul feel conjured by the gentle tremolo of Kimbrough’s electric guitar, an airy arrangement and a molasses pace that underscores the promise of heartbreak’s passing. Although Kimbrough’s previous album Wings was released nearly four years ago, he’s been working like a locomotive. His exceptional abilities as a player, singer and performer have kept him in-demand. Until early this year, when Kimbrough decided to redirect his energy into his own projects, he’d spent most of the time since early 2011 traveling the world with Harris. He’s played guitar on tour and in the studio with Crowell, Richey, Gretchen Peters, Marshall Chapman and a host of others, plus Snider, with whom he still writes and plays. 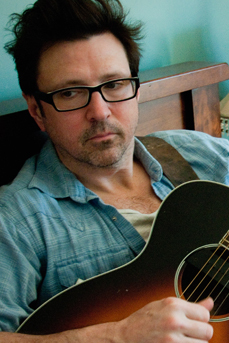 Kimbrough has also provided plenty of self- and co-penned cuts for a list of artists that includes Little Feat, Jack Ingram and a dozen numbers cut by Jimmy Buffett. “To have an ongoing relationship at that level in this business is really a gift,” Kimbrough says of his writing for fellow Gulf Coast native and entertainment world powerhouse Buffett. He also notes that his experience as a touring sideman has provided invaluable lessons. Kimbrough’s chops have been up for a long time. He traces the beginning of his rich and varied career back to his twelfth birthday, in 1976. That year his parents bought him a $20 electric guitar and amp and a ticket to see Bruce Springsteen’s “Born To Run” tour at the local theater in his native Mobile, Alabama. As a budding guitarist he embraced KISS as much as Dylan, plus the Allman Brothers, Springsteen and a host of others who blended instrumental prowess with well constructed songs. Within six months of first plugging in he was playing paying gigs at skating rinks and high school auditoriums. At 16 he dived into the punk and post-punk sound, learning tunes by Television, the Clash and Talking Heads, and then logged years in cover bands along the Gulf Coast. “One of the reasons I’ve been in demand for sessions and touring is that I learned to be able to ape any playing style,” Kimbrough offers. In addition he’s developed a uniquely textural approach that allows him to extend his guitar’s tonal palette, which explains why the battered $30 Silvertone acoustic he plays on “Home Economics” sounds like an expensive vintage electric arch top. In 2004 the Americana Music Association presented Kimbrough with its Instrumentalist of the Year Award. Other recipients include Dobro giant Jerry Douglas and the genre’s proverbial MVP Buddy Miller. In the early ’80s Kimbrough moved to Nashville with his first original band, Will and the Bushmen, and was quickly signed to a major label deal. “We were swallowed up and passed out the other side,” he says, chuckling. Next came the Bis-quits, with fellow songwriting kingpin Tommy Womack, who released a CD on John Prine’s Oh Boy! label in 1993. Kimbrough met Todd Snider on the same night the Bis-quits signed their record deal. They quickly became co-writers and musical compadres. Their collaboration has yielded a host of songs and two Kimbrough-produced Snider albums, East Nashville Skyline and The Devil You Know. Kimbrough began his string of solo albums with This, released in 2000. Since then he’s formed another band with Womack, the critically heralded DADDY, that’s cut two albums. The DADDY tune “Nobody From Nowhere” drew Buffett’s attention, and the world’s most famous beach bum recorded that number and three more of Kimbrough’s tunes on 2009’s Buffet Hotel, including “Wings,” the title track of Kimbrough’s 2010 album. Kimbrough’s recently added another band to his resume. Willie Sugarcapps, an aggregation of all-star indie songwriters that also features Grayson Capps, Corky Hughes, and Anthony Crawford and Savana Lee of the duo Sugarcane Jane, was formed last year after a particularly fertile meeting at a songwriter’s night at the Frog Pond in Silverhill, Alabama. The group released a debut album, called Willie Sugarcapps, in August.